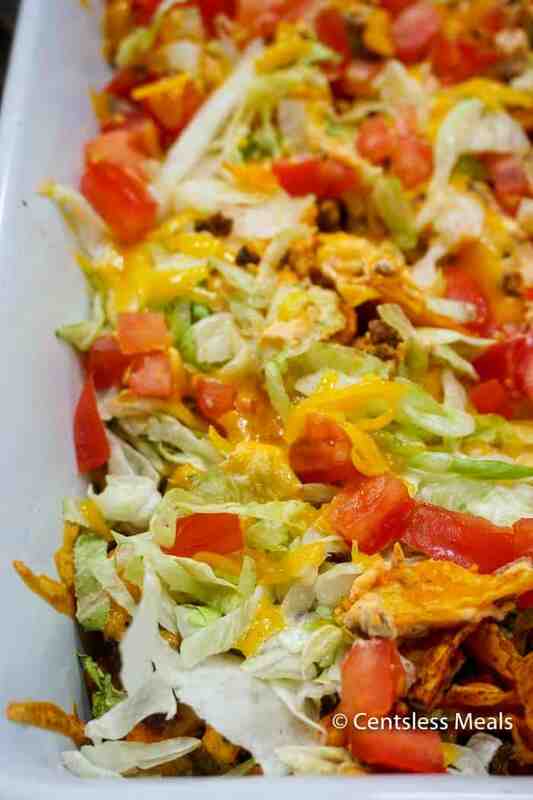 This Easy Taco Casserole will definitely dazzle your taste buds! It’s got all of the spicy flavor combinations you love, mellowed perfectly by the cream cheese and cheddar cheese (and a surprise crust that makes for a totally delicious and unexpected flavor). 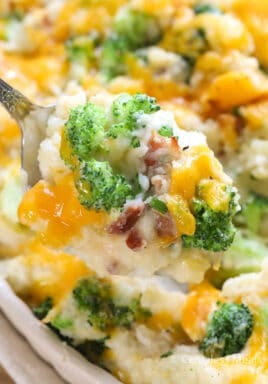 It’s a casserole that will be requested often in your household! 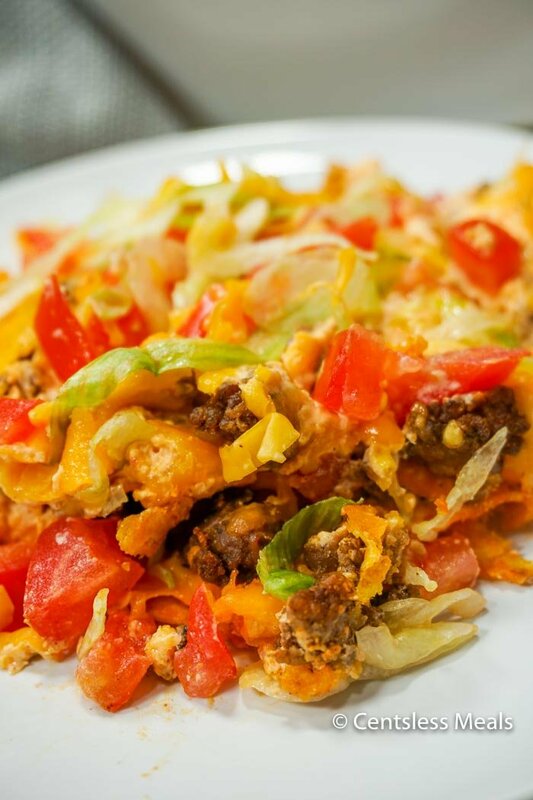 We love serving this taco casserole alongside some other tex mex favorites like spaghetti tacos. Taco night is always a great idea around here! This dish is special not only because of its great blend of spicy and mellow flavors, but also because you can “customize” it in various ways. The ground beef can easily be replaced with ground turkey. 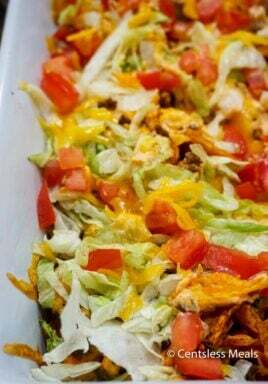 Or, consider making a chicken taco casserole by substituting shredded baked chicken (white and/or dark meat) for the ground beef. And of course you can serve this delicious casserole with tortillas on the side, with rice, or even with noodles — all of which make for a hearty meal! The variety of salsa you use — mild, hot, chunky, salsa verde — is totally up to you, based on your taste and desired level of heat. Whatever variety you choose will mix beautifully with the cream cheese and cheese. Colby or Monterey Jack cheese can replace the cheddar cheese, and since there’s already some spiciness in the taco seasoning and salsa, you can even use a milder cheese like mozzarella. 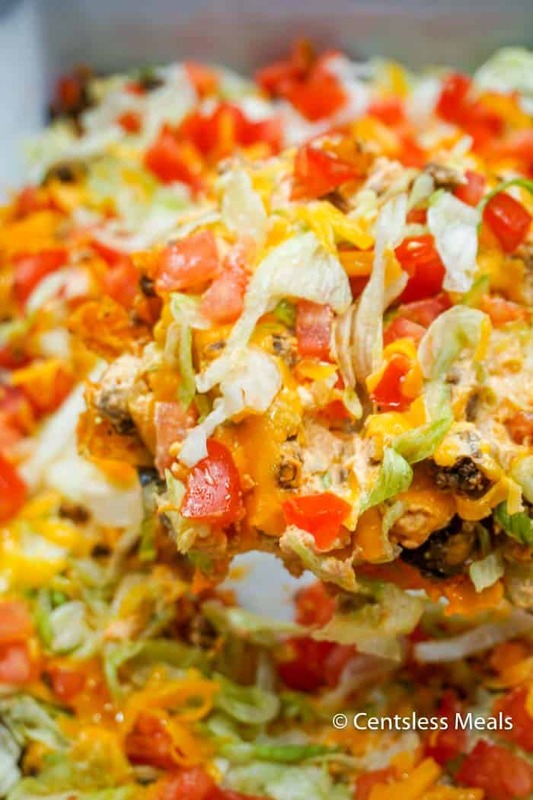 What makes this an easy taco casserole is that it’s made in simple layers. Once your cream cheese is at room temperature, you can prepare your additional ingredients in a snap! And once you’ve cooked and drained the seasoned and crumbled ground beef, the fun really begins! Evenly cover the entire greased bottom of your casserole dish with the crushed nacho chips. The cream cheese mixture will be a little thick, so use a spoon to top the ground beef mixture with the cream cheese mixture, and then lightly spread it out evenly. For extra flavor and color, toss in some chopped black olives or a few jalapeño peppers along with the shredded lettuce and tomatoes. Spaghetti Tacos Recipe – another kid’s favorite! Biscuit Taco Pockets – kids love these! 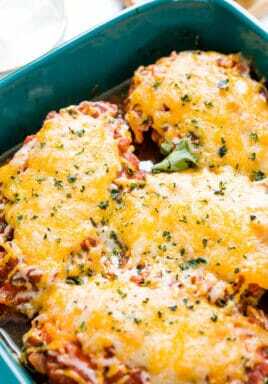 Ground beef, cheese and all of the fixin's in one delicious casserole. Grease a 9x13 baking dish and add the crushed Doritos to the bottom of the pan. Cook ground beef and add taco seasoning as directed on the package. Spoon ground beef onto the crushed doritos. In a medium sized mixing bowl, beat cream cheese, slowly add in salsa. Once thoroughly mixed, top ground beef with cream cheese mixture. Top with 1 1/2 cups of shredded cheese. Bake at 350 degrees 25-30 minutes, or until hot & bubbly. Top cheese with shredded lettuce, diced tomatoes and remaining 1/2 cup cheese. Sounds delicious Sara! Thank you for sharing. Not very often do I find a Recipe that the Whole Family Loves! Now that my Children are grown I more than ever treasure Meals that can bring them home for Dinner!! So glad you love this taco casserole! We do to! Love this recipe! I doubled the recipe in the 9×13 pan and it came out great. I’m so glad that you love the recipe, and that your sister did too Debbie! I am cracking up reading about people cooking the lettuce! Anyway….I am going to try this recipe and substitute the Doritos for regular tortilla chips. This sounds like a really good taco salad recipe!!! The flavors are great but it seemed a little dry…my husband & I both agreed. Maybe doubling the cream cheese sauce or adding a small can of Rotel tomatoes?? I haven’t found it dry, so agree that adding extra cream or delicious Rotel could help add extra moisture if you prefer! Thank you for stopping by Candi! Does it have both sour cream and cream cheese in it? In the commentary about the recipe it talks about both but the recipe just calls for cream cheese. Just cream cheese – updated! Thank you Pam! I made mine with two 24 oz porterhouse steaks cooked medium. Two twicebaked potatoes, used a light spring mix salad with bacon, honey goat cheese, and cashews. It was wonderful thanks for the great idea!!!!!!! You don’t add the lettuce until AFTER it has been baked. Most likely WHEN you’re ready to eat. READ the recipe. Geesh! Made this tonight, my husband and I loved it. You add the leuuce and tomatoes after it comes out ot the oven. Great sounding -and easy too! I am looking for easy, simple and good recipes for one of the teachers that I work with.. She is having her second child (another boy) in September and I would like to make her some dishes for when she comes home. Additionally, I want to give her some easy recipes to make herself after she and the new baby gets settled with her 5 year old and husband. And/or for some of the other teachers, as well as myself to prepare, but not bake/cook -so she can store in the freezer and take out and bake or microwave when ready to have. I make this all of the time! I don’t measure anything out exactly. I like a little extra Doritos, and don’t use as much cream cheese. I cook it with the lettuce and tomatoes, and it’s still very good! If a recipe reads two cups of chips, crushed. Then you measure first and then crush them. rule applies to all recipes. 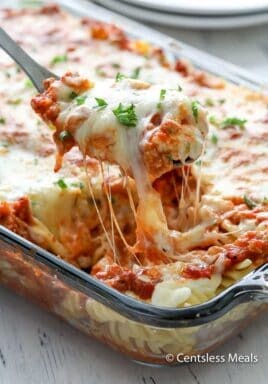 I’m making this tonight for dinner, but also will be adding the lettuce, tomatoes and olives after baking. I don’t like warm wilted lettuce. I made it without the cream cheese and just used a can of tomato sauce for moisture. No sour cream either. Layered the cheese, then I added the Doritos to the top, baked and then added the lettuce and tomatoes after. I put more doritos than it says 2 cups I put half bag then crunch it easily.. As doritos does get soggy after sit it little too long I like it more crunchy. Or I did cook it with out the doritos as a crush and use doritos as a dip. As a vegetarian I would swap the ground beef for black beans and season to my own liking. I don’t care for the soy meat substitute stuff. Sounds yummy otherwise! I don’t use lettuce anymore; I swap lettuce with fresh spinach. Get the health benefits of spinach since lettuce pretty much is just a filler, and spinach is tasty as well. I’m going to be making this for sure. Thanks for the recipe! I like cold lettuce too. can you add it after? I substituted Ricotta cheese for the cream cheese, because I had it on hand. It makes for a lighter dish. I took advice of other posters and sprinkled cold lettuce and tomatoes onto the casserole pieces as I served them. What I would do differently make the meat more juicy, by adding more water than my seasoning mix called for, and putting the meat and doritos in the oven for 10 minutes, then add the cheese/salsa mix, shredded cheese, and yes, sliced black olives as shown in the picture, and cook an additional 15 minutes ’til the cheese melts. Very tasty dish and I will make it again. I have to agree with Andrea…but I prefer cold lettuce over warm on any dish. In fact, I think I will add the lettuce and tomato after it is cooked. It sounds delicious:-) Thank you for the recipe! You don’t cook it with the lettuce on it. Re-read the recipe. You top with cheese and bake. Once it’s done, you add the lettuce, tomatoes & remaining cheese. Omg…. can people not freaking read? Everybody thinks they’re supposed to cook the damn lettuce! It says CLEARLY to add after cooking. I want to pull my hair out! You cook the lettuce? That doesn’t seem right. It doesn’t say that. After you have melted the cheese, you add the lettuce, tomatoes and more cheese and eat.